A monument commemorates the 8 Hours Movement which was initiated in Victoria in 1856. The monument was originally unveiled in Spring Street in 1903. In 1924, the monument was removed to Russell and Victoria Streets and unveiled for the second time on February 13th, 1924. The Eight Hours League campaigned for an eight hour day on the basis of eight hours work, eight hours for rest, and eight hours for recreation and education. On 26th February 1856, James Galloway convinced a meeting of employers and employees to begin implementing the 8 hour day. A public holiday was declared and floats were prepared to represent the various trades, and was celebrated until the last procession in 1951. The Eight Hour Day was a campaign that brought about one of the most important changes to the rights of workers. There were two major campaigns that took place, both in Sydney and Melbourne, but it’s the Melbourne movement that is widely known for successfully changing the general rights of workers for the better. In 1856 on April 21st, Victorian Stonemasons staged a well-organised and executed protest. The Stonemasons had been working on the construction of the Old Quadrangle Building, the original site of Melbourne University, when they all downed their tools and proceeded to march on to Parliament House along with other members of the building trade. During the march held in Melbourne, those attending the protest carried banners that held the symbol of three figure 8’s. The intertwined numbers '888' represented the ideal that the workers were fighting for – “8 Hours Work, 8 Hours Recreation, 8 Hours Rest”. Coined as early as 1817 by Robert Owen, an English Socialist, the significant motif of this slogan would later adorn many of Australia’s union buildings. Following the success of the Eight Hour Day protest, the Stonemasons celebrated that year with a holiday and procession held on Monday 12th of May, known as the Whit-Monday holiday. Inspiring all that benefited from the new law, the parade saw almost 700 people take part in the march, with patrons of the parade holding backgrounds in as many as 19 trades. Travelling from the Carlton Gardens to the Cremorne Gardens in Richmond, the march was a festive event with workers marching proudly with decorative banners alongside floats and bands performing. Moomba festivities since then obscure the original meaning of the celebration. 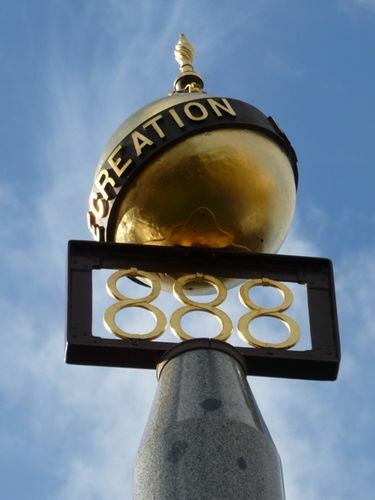 The required 3000 pounds was not initially subscribed and only the pedestal was erected, In 1903 Percival Ball`s model was followed with the erection of a granite column surmounted by three large figure eights and above that sphere representing the world. The working men of Ballarat erected this monument in honour of Thomas Galloway, the founder of the 8 hour system in Victoria. Traditionally Melbourne claims Australian parentage of the Eight-Hour Day.